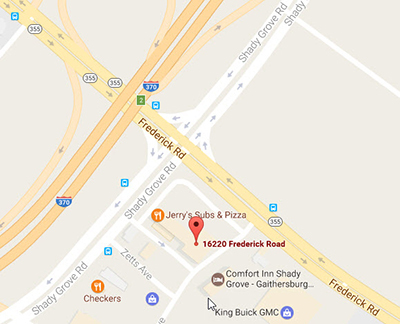 Locations South of Gaithersburg: From Bethesda & Rockville: Take 270 North, exit 9 Shady Grove Rd. bear right from the exit. Continue south on Shady Grove Rd., make left at RT.355. The building is on the right (first right). ALTERNATE ROUTE: Go North on 355. Make U Turn at Shady Grove Rd, the building is on the right (first right).